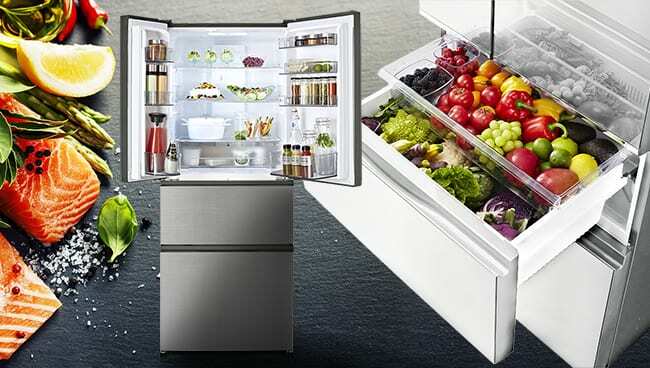 Panasonic has launched a new range of premium multi-door refrigerators, developed in line with our goal of keeping food fresher for longer, using less energy. 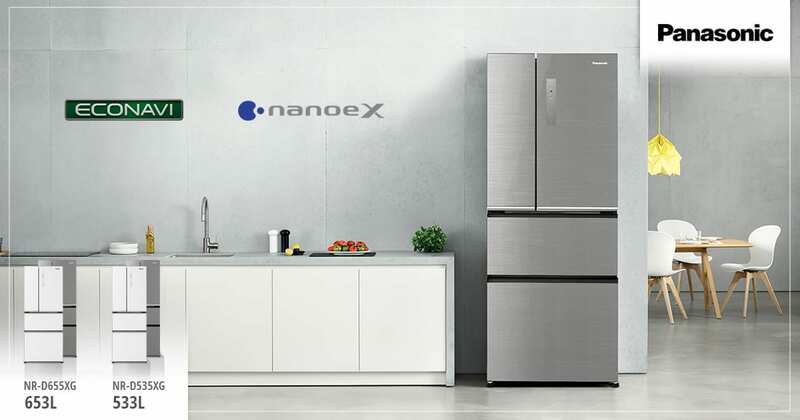 The new models feature three separate temperature-controlled storage compartments, complemented by nanoeX technology to reduce bacteria and odours and sophisticated sensors that automatically optimise energy performance. The stunning range is available in a choice of 653 or 533 litres and a silver or white design, complete with elegant glass door finishes and an integrated touch-control panel. Cleverly designed with three separate temperature-controlled storage compartments, the new range is geared towards specific food groups being stored in conditions that best suit them. The main fridge compartment has adjustable tempered glass shelves to allow for more efficient and flexible storage, along with extra-roomy door pockets to accommodate bottles and jars. The 0°C Chilled Case preserves dairy items and perishables like meat and fish by maintaining a temperature of approximately 0°C to chill food without freezing. The independent fully-extendable fresh produce compartment is easy to access and offers optimum high-humidity cooling at approximately 6°C. The bottom drawer is designed for bulkier vegetables, while the top provides the perfect space for delicate items like grapes and tomatoes. 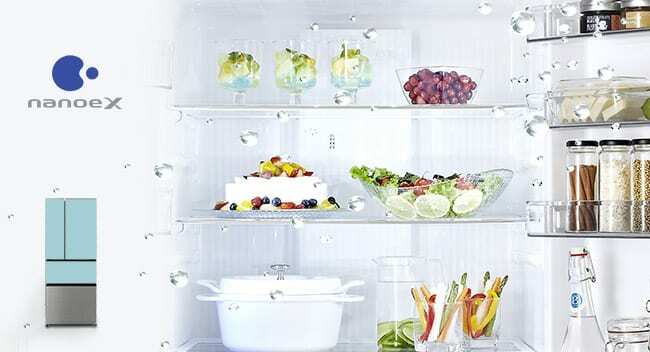 Within the freezer compartment you’ll find neatly divided storage options. The upper case is ideal for flat items like frozen pizzas, while the lower case suits large items such as home-made frozen meals, chickens or legs of lamb. There’s even a separate twisting ice tray so you’ll always have a stockpile of cubes for cold drinks! Panasonic’s highly effective nanoeX technology atomises water particles into nano-sized ions that maintain the nutrients in fresh produce, and eliminate more than 99.99 per cent of bacteria while suppressing odours. 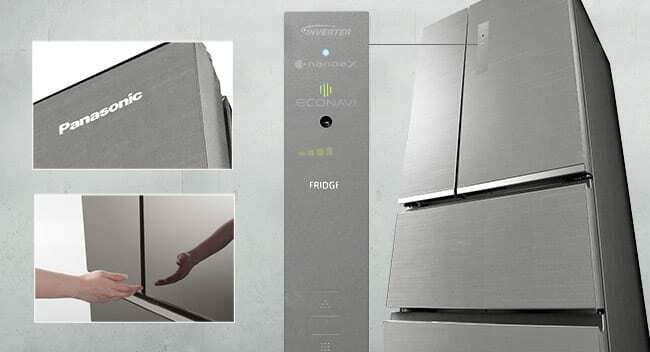 Set into the sophisticated full-flat glass doors you’ll find an electrostatic touch-control panel that lets you adjust the settings of any of the three main compartments without opening the fridge. 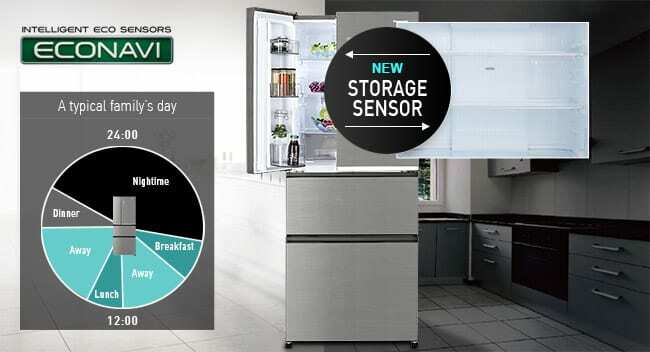 Five ECONAVI sensors (fridge door sensor, internal temperature sensor, storage sensor, room temperature sensor and light sensor) work together, allowing for maximum performance. Panasonic have been manufacturing fridges for over 60 years, and we’re continuing that heritage with a brand new multi-door range. 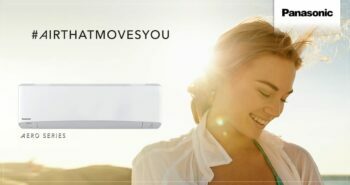 Our product guru is here to take you on a tour of features packed into these stunning models; from the stylish design, to the multiple temperature-controlled compartments ideal for all your family’s storage needs, clever tech-innovations like nanoeX to reduce bacteria and ECONAVI to save energy, plus so much more! Panasonic encourages families to get cooking together with our new convection, grill and combination microwave. A practical solution for smaller kitchens and time-poor households, the slim-line convection 27L NN-CD58JS has the versatility to create a range of meals, from grilled fish to the family roast chicken. The 34cm turntable and spacious interior fits larger plates and dishes. A Junior Menu creates tasty treats from pureed fruit and vegetables for babies, to junior pasta bakes and vegetable fries ensuring even the fussiest eaters can still enjoy healthy delights. 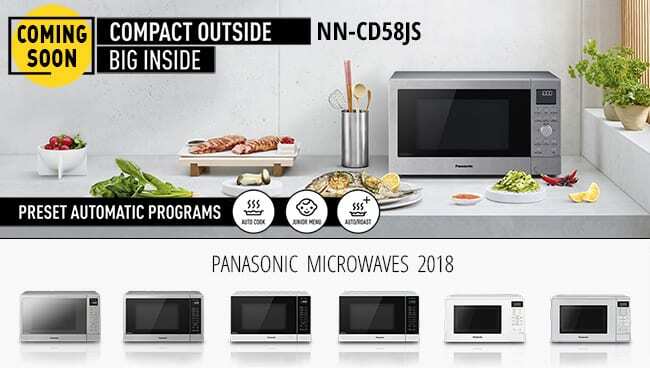 This flagship model is complemented by a range of new Panasonic microwaves offering ease of use and a variety of features to help busy families provide healthy meals. 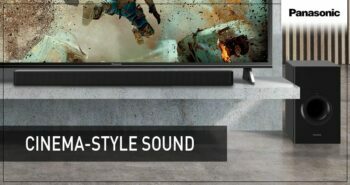 The flagship NN-CD58JS lands in September and all other models are available now at all major consumer electronics retailers. Calling all vino lovers! 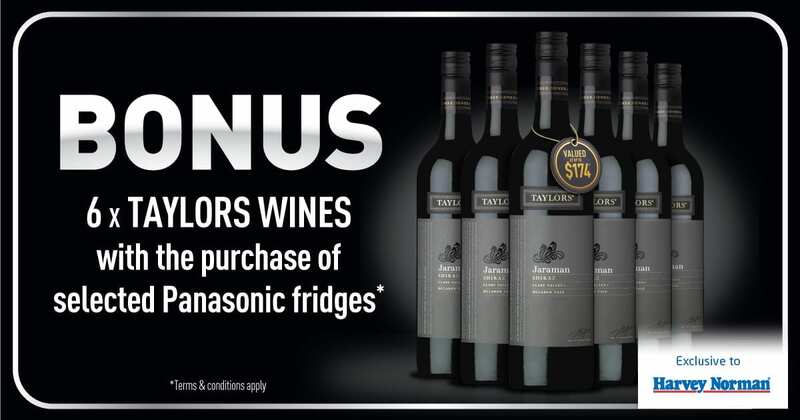 When you purchase a Panasonic French door or multi-door fridge from Harvey Norman before 26 September 2018, you’ll be able to raise a glass and toast your new purchase in fine style with a BONUS 6-bottle case of Taylors Wines Jamaran Shiraz*. Step inside the Panasonic kitchen and see how we’re using market-leading technology to create the ultimate wellness centre where food stays fresher for longer, healthy gourmet meals are cooked in a flash and special dietary needs are covered fuss-free. 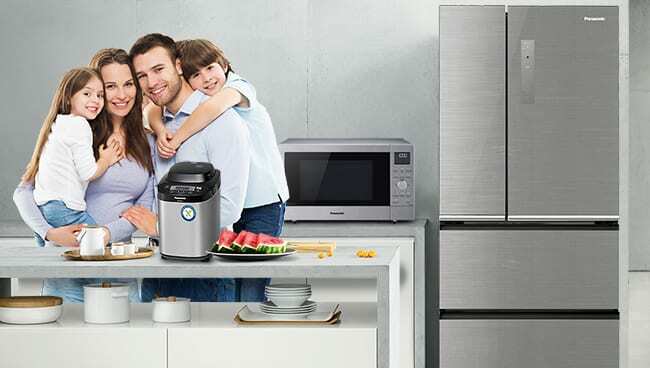 Multi-purpose microwaves, specialty bread makers, versatile rice cookers, and fresh-food fridges all combine to improve your health and wellbeing in the Panasonic kitchen.